The selection of Tydavnet Show Queen 2019 took place in the Sliabh Beagh Hotel, Knockatallon on Saturday 13th April. Three local ladies were chosen to contest the event, and these were generously supported by local sponsors. Rachel Woods was sponsored by her employer Declan McCarvill Retail, Tydavnet and Ballinode; Eleanor Murphy was sponsored by Sliabh Beagh hotel, and Lauren Treanor was supported by Truagh Macra na Feirme. Judges on the night were Barry McQuaid, Karen Callaghan and Eunice Jebb, while Brendan Finan was a very capable MC. In attendance on the night was Jim Harrison from Castleblayney, from the Irish Shows Association. Prizes on the night were generously sponsored by Mary Buckley (tiara), JP Flowers, Tydavnet Show (Crystal), and Maurice Grahams (voucher). Thanks also to TJ and Roisin Treanor, Wilson Bros, Raleigh School Ireland, Connolly Pharmacy, and Silver Hill Garden Centre and Farm Shop for generous raffle prizes. First on stage was Eleanor Murphy from Killylough, a 5th year student at Beech Hill College, Monaghan. Eleanor hopes to study Nutrition, Food and Business Management in St Angela’s Sligo, after her Leaving Cert next year, and intends to go into the Quality Assurance aspect of business. She plays football with Scotstown Ladies, and in her spare time she participates in the Pope John Paul II awards, she is also a volunteer with Monaghan Arch Club, and with Tydavnet Show each year. She intends to go to Coláiste Bhun an Inbhir during the summer. Next up was Rachel Woods, aged 17, a student at St Louis Secondary School. She works in McCarvill’s shop. Rachel is an accomplished musician, and likes playing the harp, fiddle, whistle and guitar. She too enjoys volunteering, and is undertaking the Pope JohnPaul II awards, the Gaisce awards, and is currently volunteering with the Special Olympics, the Arch Club, and Tydavnet Show. Rachel played a delightful air on the harp. Lauren Treanor or Lauren Crush as she is affectionately known is a member of Truagh Macra who sponsored her participation on the night. She recently participated in the Macra King and Queen competition in Sligo, and she loves country music, particularly Derek Ryan. She works in Jack’s Bar in Tydavnet on Tuesdays and at weekends, and she hopes to go travelling. She enjoys working with horses, and spent time working in the racing yard of noted trainer Paul Nolan at Enniscorthy, Co Wexford. She hopes to study Equine Management in Enniskillen. If she got €1,000 she would head for New Zealand. The girls were interviewed early in the evening, and later on stage with MC Brendan Finan, and all three were excellent ambassadors for their community. However, there could only be one winner – and the 2017 Queen Shauna McAree was on hand to present the Show Queen Sash and Tiara to Rachel Woods. 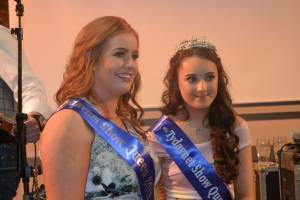 Shauna spoke of the many events that she got involved in during her reign, and Rachel was also presented with flowers by Sinead McCarey, another former Tydavnet Show Queen. It was a fantastic, well supported night, and LimeLite provides great dance music to keep the party going. Best wishes to Rachel in her role as Tydavnet Show Queen 2019.